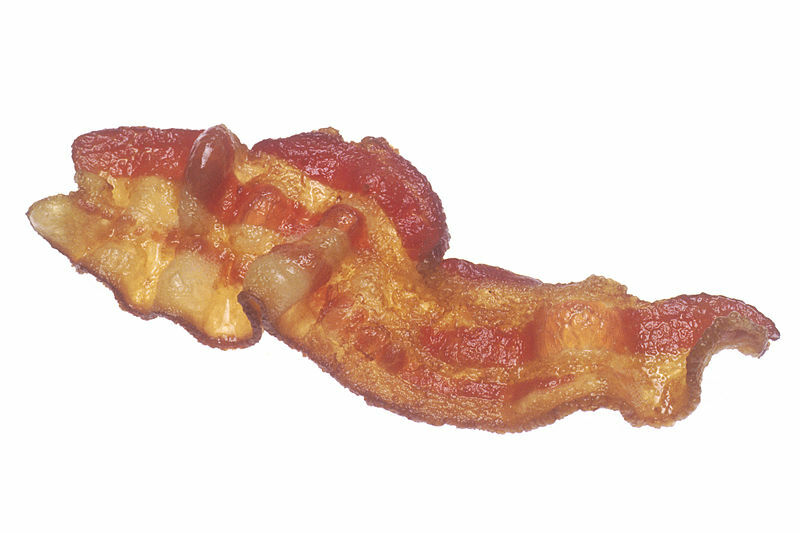 When I need a lot of bacon I cook it in the oven. This past weekend was hot and we were trying to avoid using the oven while making breakfast for dinner. I ended up using the outdoor grill to cook the bacon and I’m very happy with how it came out. It wasn’t too soft nor so crisp to be brittle. I’ll definitely do it this way in the future. I was at a loss for what to have for dinner this week so I turned to an old stand-by, breakfast for dinner. My husband introduced me to roasted beets early in our relationship. I couldn’t stand beets when I was growing up. It was probably because they were canned and then boiled. That’s no way to treat a beet. Roasting brings out a sweetness and earthiness in the beets. They are delicious plain however we can’t resist a bit of oil and candied orange peel. Any citrus zest can be substituted for the orange peel. It won’t be the same but it will be close. Position rack in the center of the oven and preheat oven to 375°F. If the greens are still attached to the beets remove them, leaving 1″ of stalk on the beet. Scrub the beets well under cool water to remove any surface dirt. Place the scrubbed beats in a 13″x9″ glass pan. Add 1 cup of water and cover the pan with aluminum foil. Bake for an hour and check the beets. If a paring knife easily pierces to the center of the beet then it is ready to come out. If not bake for another 10-15 minutes and repeat. Uncover and allow the beets to cool for 10 minutes or so. When they are cool enough to hold (a silicon pot holder is useful here) use a pairing knife to remove the top of the beet and then peel the skin from the beet. Quarter beets and place in a bowl. Add the olive oil, chopped orange peel plus kosher salt and black pepper to taste. Stir to combine and serve. Save the greens for another use by wrapping loosely in a damp paper towel and placing in an open plastic bag (such as a bag from the grocery store). They should stay fairly fresh for a day or two. You may want to wear disposable rubber gloves while you peel and cut up the beets. Unless red hands are your thing. When our friend with the walnut allergy isn’t around we’ll use walnut oil in the place of olive oil. Very tasty. The weather was lovely, the farm stand near work is open, strawberries are in season. This week the menu creation started with dessert, then sides and finally the protein. The window for fresh local strawberries is 3-4 weeks so I’m having them as often as possible. The farm stand had just harvested kale and beets; score. Boneless pork sirloin was on sale at Ye Olde Grocery Mart so it took the stage. This was originally going to be a strawberry-rhubarb cobbler. I bought some rhubarb from our local food co-op last week so I was looking for a use for it. My mom returned a plastic container with some strawberries from her backyard. I figured I could find enough local strawberries to make the dish. Alas a big rain last night kept the local farmers from the fields to harvest their crop. So I turned to the freezer for a handy bag of mixed berries from Trader Joe’s. I’ve basically followed the recipe for ‘Best Rhubarb Dessert from King Arthur Flour. The result was very tasty, especially with a scoop of vanilla ice cream. Here’s the recipe, with my changes and additional notations. Preheat the oven to 350°F. Place the rhubarb in the bottom of a 3-quart baking dish. Add the thawed mixed berries and cut strawberries to a bowl. Add the sugar and corn starch. Stir to combine and let sit for 15 minutes or so. The juices from the berries will help to dissolve the sugar and the corn starch with help thicken the sauce. After the rest, pour the berry mixture over the rhubarb. Mix together the flour, sugar, baking powder and salt in a bowl and set it aside. Add the egg to the melted butter and mix to combine. Add the milk and vanilla; again mix to combine. Add the liquid ingredients to the dry mixture. Stir to combine into a thick dough. Scoop heaping tablespoons of the dough over the fruit mixture. Bake for 45 minutes. If the top has not browned sufficiently increase the heat to 400°F and cook for another 10 minutes. The fruit should bubble along the edges of the biscuits. Remove from the oven and allow to cool for 5-10 minutes. No one likes a burnt tongue. I highly recommend serving this with a scoop of vanilla ice cream. I came across a similar recipe while trying to figure out what to make for our regular Saturday night dinner. There are dozens of versions of this dish online. I think the first one I came across was by Robyn Stone at Add A Pinch. Trim chicken breasts of excess fat and connective tissue. Sprinkle both sides with kosher salt and cracked black pepper. Spray a 13″x9″ baking dish with cooking spray. Arrange chicken breasts, “skin” side up, in the pan, tucking a bit of the tip under the breast to prevent over cooking. Bake for 20 minutes. Heat the olive oil over medium heat. Add the shallot and sprinkle with a pinch of kosher salt. Saute the shallot for 3-5 minutes until softened. Allow to cool for 5 minutes. Quarter the artichoke hearts and cut into 1/4″ pieces. Place in a clean dish towel, gather the corners together and twist to remove excess liquid. Place in a bowl. Squeeze the excess liquid from the spinach using the same dish towel. The drier the spinach and artichoke hearts the thicker the sauce will remain. Break apart the ball of spinach into the bowl. Add the cooled shallots, garlic, yogurt, mayo and cheeses to the bowl. Mix well to combine. Taste for flavor and add salt and/or pepper to taste. When the chicken has baked for 20 minutes remove the pan from the oven and top the chicken with the spinach-artichoke dip. Spread the dip evenly over the chicken. Return the chicken to the oven and bake for another 20-25 minutes. The chicken should be cooked to 165°F. If not return it to the oven for another 5 minutes. It’s been almost a month since we hosted our regular Saturday night gathering. We went away for a couple of weeks and celebrated a birthday last week. It was nice to get back into the kitchen and cook for just our close friends again. Spinach Artichoke Chicken (or SpinArt Chicken as I named it).